Arthur St. Clair was a political and military leader in the Ohio country in the years of the American Revolution and the new nation. He was the first governor of the Northwest Territory. St. Clair was born on March 23, 1736, in Scotland. Some sources list his birth year as 1734 or 1737. Little is known of his early years, and there still is some dispute over exactly who his parents were. He probably studied briefly at the University of Edinburgh and then left school to study anatomy with a man named William Hunter. By 1757, St. Clair had enlisted in the British army as an ensign and was serving in North America during the French and Indian War. In 1762, St. Clair retired from the army with the rank of lieutenant. With funds from his father-in-law, Governor James Bowdoin of Massachusetts, St. Clair purchased approximately four hundred acres of land in the Ligonier Valley of Pennsylvania. This made him the largest property owner in Pennsylvania west of the Appalachian Mountains. Due to St. Clair's prominence, the governor of Pennsylvania made St. Clair his assistant for the frontier areas of the colony. St. Clair also served as a member of the Westmoreland County court beginning in 1773. This position often put St. Clair at the center of controversy. Both Pennsylvania and Virginia claimed land in the Ohio Country, including Fort Pitt (modern Pittsburgh). While St. Clair tried to win control of this area for his state, Virginia usually emerged as the victor in their respective battles. St. Clair also preferred friendlier relationships with the American Indians of the Ohio Country. He hoped to see Pennsylvania benefit from the fur trade, while the Virginians wished to settle the American Indians' land. St. Clair's actions in favor of the American Indianss may have spared settlers in western Pennsylvania some of the nations' wrath during Lord Dunmore's War in 1774. As the American Revolution began, St. Clair became a supporter of the patriot cause. He served on his county's Committee of Safety and served as secretary to representatives from the Continental Congress sent to the Ohio Country to negotiate with the Indians. 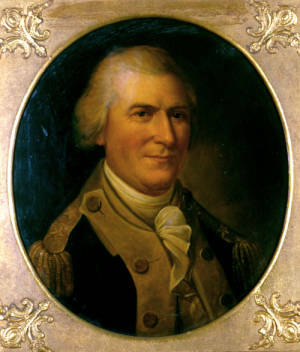 In 1775, the Congress appointed St. Clair to the rank of colonel in the Continental Army. St. Clair participated in America's attack on Canada in 1775. During the winter of 1776-1777, he assisted Washington at the battles of Trenton and Princeton. In the spring of 1777, having attained the rank of brigadier-general, St. Clair became the commander of Fort Ticonderoga in New York. This fort served as a major deterrent to the British seeking to invade their former colonies from Canada. St. Clair evacuated the fort, allowing it to fall into English hands. The Continental Army held a court martial of St. Clair for his actions. He was found innocent of all charges. He continued to serve in the Continental Army, but higher authorities refused to place him in command of strategic locations such as Fort Ticonderoga. In 1785, Pennsylvania elected St. Clair to represent the state in the Confederation Congress. He served as the president of the Confederation Congress in 1787, his last year in office. That same year, the Confederation Congress appointed St. Clair to be the first governor of the Northwest Territory. He remained in this position until 1802. One of St. Clair's most trying problems as governor was dealing with American Indians who believed that they were the rightful owners of the land. In 1789, St. Clair convinced at least some of the American Indians to sign the Treaty of Fort Harmar. This treaty required Ohio's American Indian nations to give up much of their land in Ohio and to open those lands to white settlement. Most American Indians refused to honor the treaty, however. Many important American Indian leaders were not invited to the negotiations or refused to participate. Those leaders who did sign the document often did not represent their entire tribe. Rather than establishing peace with the Ohio Country's American Indians, the Treaty of Fort Harmar incited them to resist white settlement of their land. To protect settlers and to force the Indians to abide by the Treaty of Fort Harmar, St. Clair ordered the construction of forts in western Ohio. St. Clair also dispatched General Josiah Harmar and an army of nearly 1,500 troops to attempt to conquer American Indian nations living within the Northwest Territory. St. Clair ordered Harmar and his army to destroy the major village of the Miami at present-day Fort Wayne, Indiana. Shawnee chief Blue Jacket and Miami chief Little Turtle led the American Indians against Harmar's men and defeated them in October 1790, in a battle that came to be known as Harmar's Defeat. St. Clair decided that he had to deal with the American Indians personally. St. Clair moved against the American Indians in September 1791. His men left Fort Washington, near Cincinnati, on September 17. The men marched twenty miles in two days and then built Fort Hamilton. St. Clair's army then advanced forty-five miles northward, where his men built Fort Jefferson. Leading primarily untrained militiamen, St. Clair faced problems with desertion from the beginning of his campaign. Although it was still early fall, his men faced cold temperatures, rain and snowfall. St. Clair also had a difficult time keeping his soldiers well supplied with food. His men became demoralized. Despite these problems, St. Clair continued to advance against the Miami (in what is present-day Indiana). By November 3, his men had arrived on the banks of the Wabash River, near some of the Miami villages. Little Turtle led his warriors against the Americans on the morning of November 4. Many of the militiamen under St. Clair immediately fled. St. Clair led the regular soldiers in a bayonet charge. St. Clair had two horses shot out from under him. Several bullets passed through his clothing, and one took off a lock of his hair. The American Indians surrounded the American camp. After three hours of fighting—the remaining American soldiers fought through the American Indians and began a lengthy retreat. The survivors reached Fort Jefferson late that afternoon and evening. With limited quantities of food and supplies at Fort Jefferson, St. Clair ordered his forces to Fort Washington. Of the 1,400 men who served under St. Clair, 623 soldiers were killed and another 258 wounded. One of the survivors stated, "The ground was literally covered with the dead." The American Indians had soundly defeated St. Clair's army. President George Washington demanded that St. Clair resign from the army. St. Clair did so on April 7, 1792, but remained governor of the Northwest Territory. He still faced problems with the American Indians. In 1794, Washington dispatched General Anthony Wayne to succeed where Harmar and St. Clair had failed. Wayne defeated the American Indians at the Battle of Fallen Timbers in August 1794. In 1795, most American Indians in modern-day Ohio signed the Treaty of Greenville, relinquishing all of their land holdings in Ohio except what is now the northwestern corner of the state. As governor, St. Clair was committed to establishing law and order. He was responsible for the adoption of Maxwell's Code, the Northwest Territory's legal code. St. Clair also hoped to model the Northwest Territory after the vision of the Federalist Party, which favored an elitist government. However, many Ohioans preferred the program of the Democratic-Republican Party. It called for a relatively democratic form of government. As Ohio moved towards statehood, St. Clair actively opposed Ohio's admittance to the United States. He hoped that what is now Ohio would not become a single state but rather two states. If this occurred, St. Clair believed that the Federalists would outnumber the Democratic-Republicans. This would allow the Federalists to continue to control the government of the new states. Democratic-Republicans in what was to become Ohio opposed St. Clair's efforts. Thomas Worthington, Nathaniel Massie, Michael Baldwin, and several others urged President Thomas Jefferson, the founder of the Democratic-Republican Party, to make Ohio a state. Jefferson and the Democratic-Republican-controlled United States Congress responded by issuing the Enabling Act of 1802. This act called on the people of Ohio to form a constitutional convention and to fulfill the other requirements of the Northwest Ordinance to become a state. St. Clair denounced the Enabling Act. Jefferson responded by removing St. Clair as governor. Ohio became the seventeenth state of the United States on February 19, 1803. St. Clair then retired to his home in western Pennsylvania. He established a foundry and began to make stoves and castings. He was very liberal with his money, loaning money to his friends and family. The United States Congress failed to reimburse him for expenditures he had made while serving as governor of the Northwest Territory. Due to his financial problems, St. Clair lost most of his fortune and most of his vast land holdings. He eventually moved to a small log cabin where he died on August 31, 1818. Smith, William Henry, ed. The St. Clair Papers: The Life and Public Services of Arthur St. Clair, Soldier of the Revolutionary War; President of the Continental Congress; and Governor of the North-western Territory; With His Correspondence and Other Papers, Arranged and Annotated by William Henry Smith. Cincinnati, OH: R. Clarke & Co., 1882.